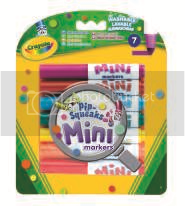 UK parents are being invited to encourage their children’s creative streak by McCain Smiles who are offering a total of 6 exciting items from the Crayola range to collect. The exclusive on pack offer is live now in supermarket freezers across the country and will continue until March 2013. 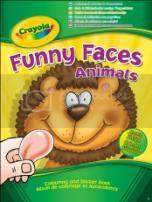 Kids love colouring and it aids their creative development, so these goodies including washable pens and sticker books are perfect to occupy the little ones during the half term or the Christmas holidays. All 6 items are great fun and versatile to use; you might even find yourself having a go! To kick start your child’s collection, simply buy two promotional packs of McCain Smiles (either 454g or 600g packs), which contain inserts featuring a code needed to claim your goodie. Log onto mccain.co.uk/smilescrayola and order the item you’d like, completely free of charge. 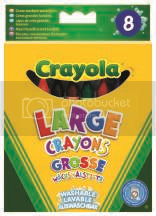 The range includes: Colouring pencils, mini markers, washable pens, 2 different colouring and sticker books and 8 giant washable crayons! 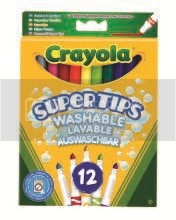 Once you receive your FREE Crayola items, visit McCain.co.uk/smilescrayola and click on the ‘fun stuff’ section where you’ll find lots of colouring-in designs and templates to print and give the little ones some inspiration. 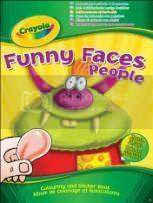 You can even upload a picture of your child’s face onto a colouring sheet to make it a personalised piece of art! 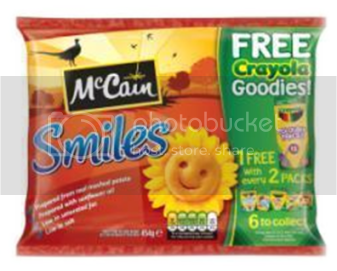 McCain Smiles are available in 454g or 600g packs from all major retailers. Disclosure Policy: I have received a pack of Crayola Mini Markers and Crayola Large Crayons in exchange for this post.